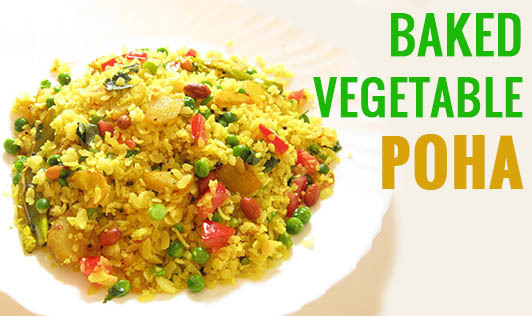 Baked vegetable poha is a quick easy-to-make, low-calorie breakfast recipe. Chopped Green Chilli- 1 no. 1. Wash the poha in a colander and keep it aside. 2. Grease a baking dish with a little oil. 3. Mix the poha, coriander, green chili, yoghurt, vegetables, lemon juice, sugar, and salt together. 4. Spread the mixture evenly on a baking dish. 5. Heat 2 tsp of oil in a karchi, add mustard seeds, and let it splutter. 6. Now add curry leaves and pour the tempering on the poha mixture in the baking dish. 7. Bake the mixture in a hot oven at 200°C for 10 to 15 minutes. 8. Garnish with coriander and serve hot. • Include boiled sprouts or peanuts in it to increase its protein content.